LINCOLN — Nebraska fell in the national rankings when it comes to ensuring children from low-income families are finding nutritious meals during the summer according to a new study by the Food Research and Action Center (FRAC). In FRAC’s latest annual “Hunger Doesn’t Take A Vacation” status report, Nebraska dropped to 46th among the 50 states and the District of Columbia in participation in the Summer Food Service Program (SFSP), a federally funded initiative that allows community organizations to provide meals free of cost to children from low-income families during summer months. According to the report, only 8.5 percent of Nebraska children that receive free or reduced-price school lunch during the school year participated in SFSP, a drop of 5.5 percent from 2014 to 2015. 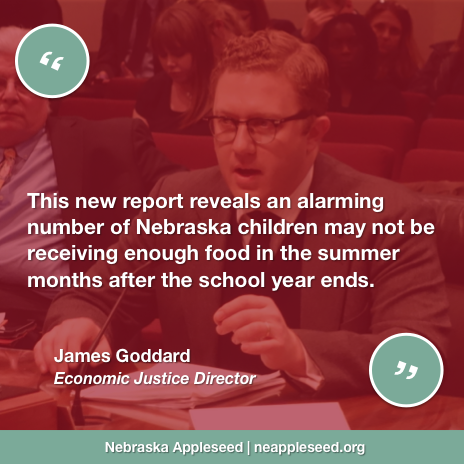 This concerning data is evidence our state still has much more to do to fight hunger for the children who may not have access to the meals they need when out of school. Part of the reduction in participation is likely due to fewer community sites serving meals in the summer in 2015. The report states there were 206 Summer Food Service Program sites operating in 2015, down from 276 in 2014 – a drop of 25.4 percent. The Nebraska Department of Education recently released the list of summer food sites operating in 2016. FRAC’s status report highlights some key ways states can improve participation in the program to help more children get the meals they need in the summer, including serving meals on weekends, beginning their summer food programs earlier in June, and increasing the number of fresh fruits and vegetable served with the meals. It’s not too late for Nebraska communities to make a difference to feed more kids in need. Organizations can learn more about starting or supporting summer food programs from the Nebraska Department of Education, and the USDA Food and Nutrition Service has a Summer Meals Toolkit to help organizations learn about supporting summer food participation at any level of program administration.